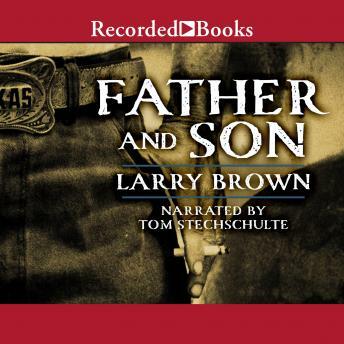 Larry Brown, a remarkable literary voice from the South, is a veteran of the Vietnam War and spent 17 years as a firefighter. Distilling his experiences, he has developed a deep understanding of the darker forces at work in men's souls. In novels like Joe and On Fire he has astounded critics and earned critical acclaim from many authors including John Grisham and Pat Conroy. Father and Son follows a bad seed, Glenn Davis, who is deeply flawed and dangerous. After serving several years in prison, Glenn has returned to his rural Mississippi home, not sure what he wants or needs. Over the course of five days, he forges a path of destruction, and violence that finally leads him to Sheriff Bobby Blanchard, who is everything Glenn is not. Larry Brown wraps the listener up in the searing conflict between these two opposites. But from their inevitable stand-off, he skillfully spins them into unpredictable directions and reactions. The stunning conclusion, swelling with unexpected notes of peace and hope, resonates with Brown's powerful talent. Excellent, a great and beautiful book. Tom Stechschulte is a wonderful reader. Larry Brown is a national treasure.